Contact the Ritz Trio to discuss how we can add an elegant and entertaining addition to your vintage or retro wedding! Introducing the fabulous Ritz Trio – a fabulous Vintage and Retro wedding Idea! Looking for Vintage and Retro wedding ideas in Scotland? Then look no further. 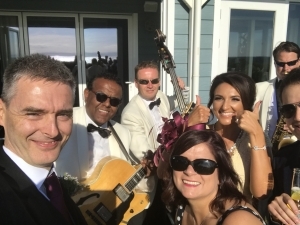 With over twenty years of experience providing quality wedding entertainment the Ritz Trio WILL make your vintage or retro wedding a truly unique, special and memorable day. Dressed in their stylish white dinner suits and a sound to match- these guys will help “Put The Ritz” into a special day. They have a special programme of tunes from the roaring 20’s including “The Charleston” and of course “Putting On The Ritz”. This professional Trio are much sought after for stylish vintage weddings and corporate events in Scotland and northern England. The band are regularly called on to provide their sophisticated music at prestigious venues such as Edinburgh Castle, Skibo Castle, Gleneagles Hotel, Balbirnie House, The Old Course Hotel, Balmoral Hotel, and Hopetoun House! Kinblethmont House, Lochgreen House Hotel, Rufflets Hotel, Dunmore Park, Culcreuch Castle, Dumfries House, Nunraw Tower, The Principal Edinburgh, Archrfield, Gailes Hotel, Kinkell Byre, Balbirnie House, Dundas Castle, Gleneagles Hotel, Glenbervie House Hotel, Errol Park, The Vu, Enterkine House, Old Course Hotel, Dunglass Estate, Marr Hall, Gordon Castle Fochabers, Glencorse House, Coos, Cathedral, Aboyne, Barra Castle, Carberry Tower, Errol Park, Logie Country Park, Rufflets, Achnagairn, Winton House, Lungha House, Crossbasket Castle. We look forward to adding your wedding venue to this list! In addition to early jazz the Ritz Trio also play an extensive list of familiar Jazz standards such as Fly Me To The Moon, Have You Met Miss Jones, LOVE (Nat King Cole), Let’s Fall In Love, I’m In The Mood For Love as well as a number of well-known Latin tunes such as Sway, Besame Mucho and The Girl From Ipanema. The repertoire also includes a few more well known popular renditions including Music To Watch Girls Go By and Can’t Take My Eyes Off You. We look forward finding out what type of music you would like. at your vintage wedding. As the Ritz Trio are able to easily move locations why not consider using the Trio to play for your ceremony and then for the drinks reception? 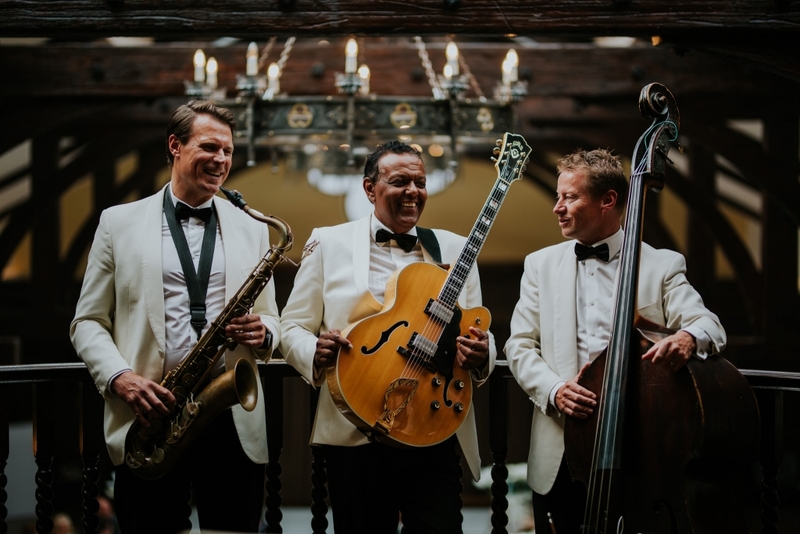 The band has serenaded many brides down the aisle and the group’s guitarist is able to play appropriate solo pieces to add variety and change the mood during the signing of the register. If you are wanting a more traditional element to the ceremony, the Trio often use the services of a violinist or a flautist to play alongside the guitarist performing many of the often requested ceremony pieces such as Pachelbel Canon in D and Highland Cathedral. Other tunes we are often asked to play include Tonight, Tonight (From Westside Story), It Had To Be You, Air On G String, Here There And Everywhere (Beatles),What A Wonderful World, Moon River and Fly Me To The Moon. We can also make suggestions for a few more contemporary pieces using the violin with the Ritz Trio throughout your ceremony and of course we are always happy to hear your own music ceremony requests! Once the ceremony is over the Trio can quickly and with no fuss move through to “jazz up” the drinks reception celebration!